Google handles 40,000 searches every second. 3,456,000,000 per day. For digital marketers, those numbers are music to our ears. Because Google Adwords allows your small business to show up for a few of those searches. When someone mentions online advertising, there’s a high likelihood they mean Google Adwords. Display, YouTube, remarketing and, most of all, search. Search is the show pony of online advertising – enabling your business to show up when someone types in a question you answer. It is, quite simply, the most important platform for driving traffic to a small business, no matter if you’re a chiropractor in Vancouver, an accountant in Fort Lauderdale, or a hairdresser in Houston. This article will give you an overview of Google’s search ads and a step-by-step walkthrough of getting your small business advertising online. 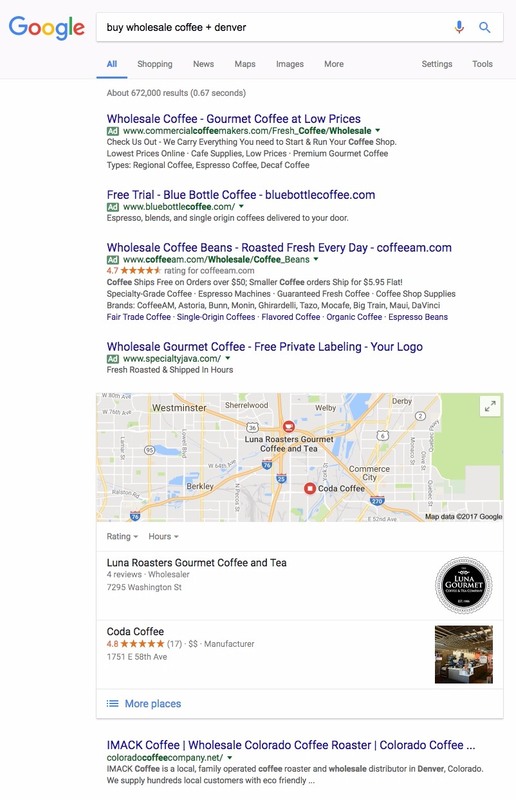 For this article, I’ll be giving a step-by-step guide to Google Adwords for a (totally hypothetical) coffee roasting company in Aurora, Colorado. Google Adwords are run based on “searcher intent.” Essentially, this means that you (as an advertiser) bid on those keywords or phrases which you’d like to appear for when someone searches. Those ads with the highest bids (and highest quality score, more on that in a second) show, while those ads which haven’t bid as much do not. The amount it costs to show when someone types in your keyword or phrases depends on a few things, including (but not limited to) the estimated value of a conversion and the amount of competition. Some of you small business owners may be in the insurance industry. If so, know that your keywords are some of the most expensive out there. However, if you’re a coffee roaster and wholesaler from Aurora, Colorado? The searcher could be researching the science of coffee roasting. There’s no clear intent-to-buy here. Low. Without intent, there’s no saying if this person is looking to buy. Placing an ad in front of them is, therefore, more affordable and will likely be less effective. The change from a verb to a noun adds intent to this search. The query is about “Coffee roasters,” and is likely a search for someone providing that service. Medium. It’s possible that this person is looking to buy coffee wholesale, but it’s also possible they want to buy a coffee roaster (something my business doesn’t do). Still a bit ambiguous. This searcher is clearly looking to purchase wholesale coffee in my specific area. High. This person is ready to purchase the product provided by myself and my competitors. It will be more expensive to show for this keyphrase. Why are Google Search Ads Effective? Google Ads, as I mentioned before, are “intent-based” ads. This means they only show up when your customers are looking for something related to your ad. This is a huge difference between many display or social ads, which show based on your declared interests or even the URL you’re on. Search ads only display when someone’s looking for the answer those ads provide. Consider the difference between a Google search ad and an advertisement on your local radio station. The DJ reads your script or plays your ad and everybody who’s listening to it hears it (actually, they probably change the station, but let’s say they listen to it). How many of those listeners, do you think, are actually in need of what you’re promoting, in that moment? Google ads are also CPC, exclusively. This means you only pay when someone clicks on your ad. And they only show to the area you’ve set them to show. For small businesses, this is a much-needed moneysaver. 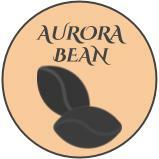 Let’s get rolling on setting up Aurora Bean’s first ad campaign. For the purposes of this step-by-step, I’ll be creating an ad campaign to drive traffic to my “first-time buyer promotion” – a promotion I’m running which gives 25%-off, exclusively to people who aren’t already using my roaster. I’m just getting into Adwords and, as yet, I’m not sure what results I’m going to get. Keyword planner recommended a budget of $2.50, so I’ll bid $2.50 with a maximum spend of $20/day. 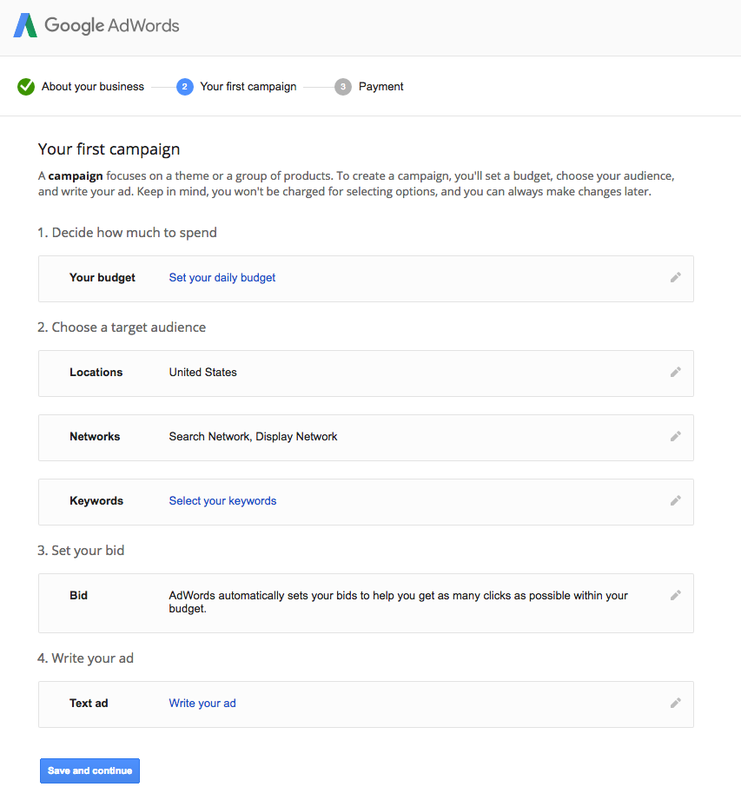 Google will only charge me if anyone clicks on my ads. 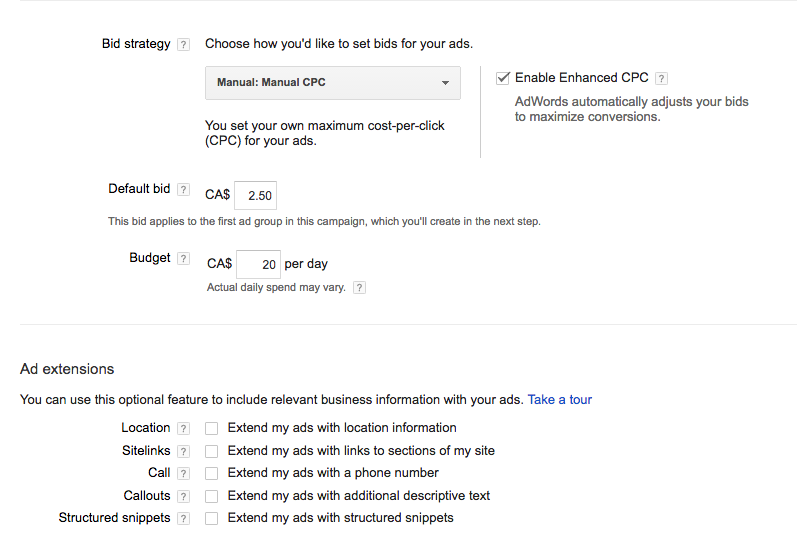 Determine your ad spend based on the chance and value of a conversion. For instance, insurance agents and realtors are comfortable spending $50 or so on a click, because every time one of those people does convert, the value of that conversion is extremely high. If only 10% of 100 website visitors are converting on your $10 product, $1/click would just cover your budget. You can see ad extensions at the bottom there, but for now we can leave them. If you want to learn more about them here’s a great walkthrough from Google. The dumbest thing I can do here is send all the people who click on my ad to my homepage. 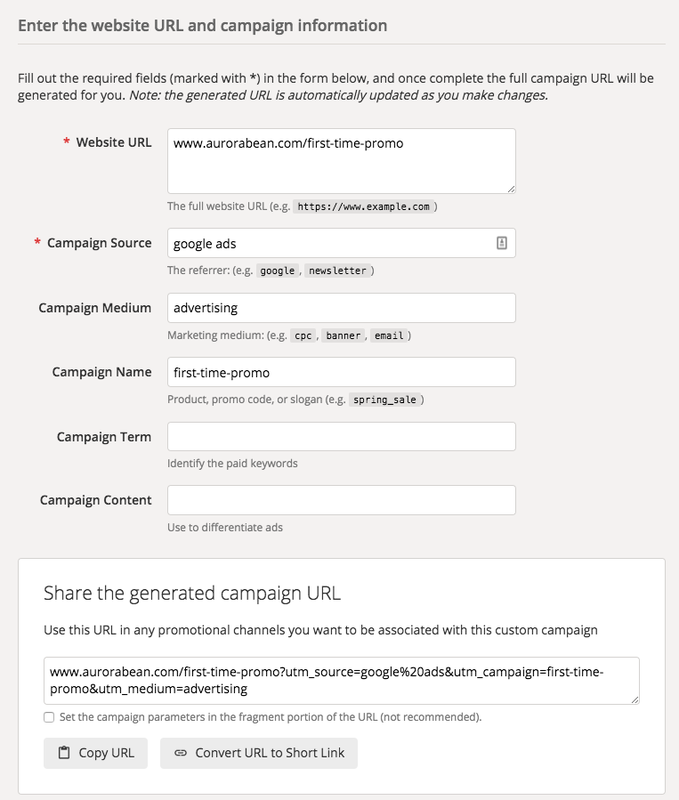 It’s a great site, but it’s not optimized to receive ad traffic for this specific campaign. If I sent everyone who clicked on “Buy Wholesale Beans – 25% off First Purchase” to my homepage, which focuses on my address and a picture of a happy Peruvian farmer, the chance of them converting is significantly less than if I send them to a page dedicated to this 25%-off promotion. This is called a “landing page” and if you hold on for a few chapters of this site, we’ll get to creating one and making it awesome. Whenever anybody clicks on my ad link, they’ll navigate to that unique URL and, when I go into Google Analytics later, I’ll know exactly how many people I sent from Adwords and how many i sent from other traffic sources. Now we’re into the interesting part – choosing our keywords. The keyword strategy I recommend for many small businesses allows you to dip your toe and maximize your ad budget at the same time. I don’t know which keyword will drive the most business. No idea. I mean, I have a few likely candidates (wholesale coffee beans, buy coffee beans Denver, coffee bean supply, etc) but I don’t know for sure. So I have a couple options. 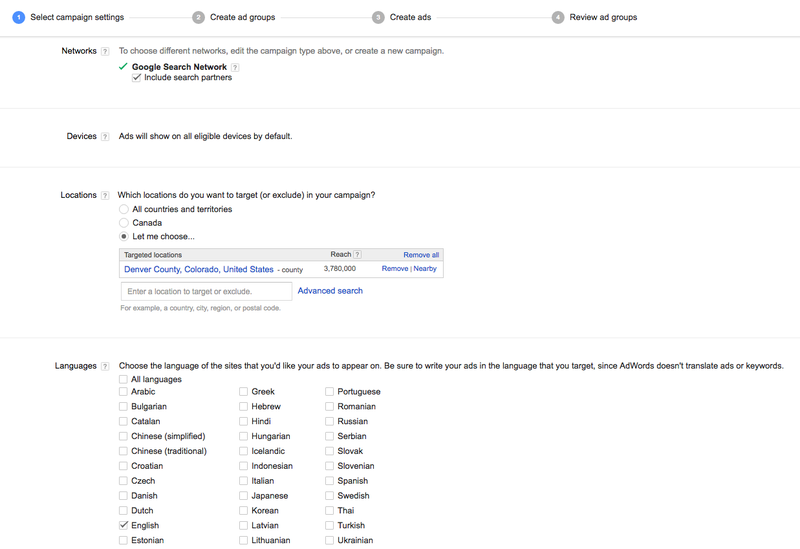 I can either go to Google’s Keyword Planner or go straight to the “Create Ad Groups” page and have Google check it for me there. 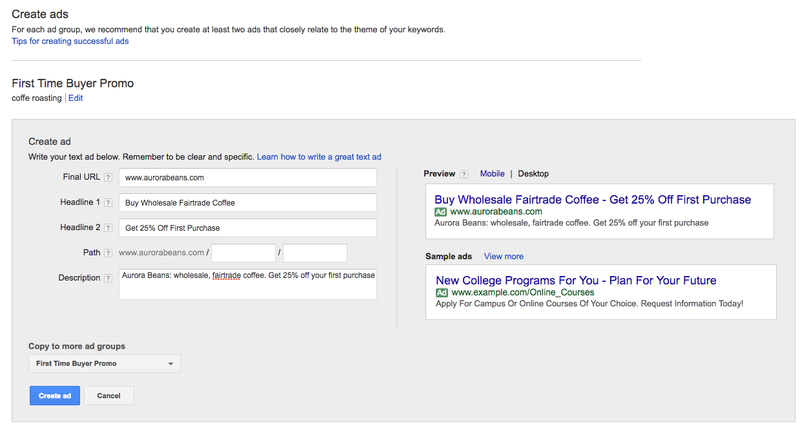 Once Google has given me my keyword ideas, I spread my ad budget over all of them. Yes, this means possibly spending a bit more, but it’ll pay off, believe me. Google Ad creative is more than just words on a page. The copy you use actually influences your quality score. Your ad’s placement on Google’s search results isn’t just about your bid. It’s also about how good your ad campaign matches the search results. 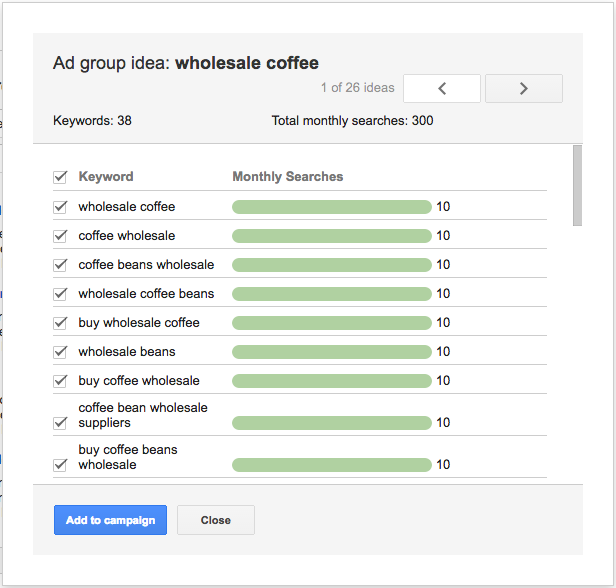 You could pay $50 for a click worth a buck fifty, but if the search was for wholesale coffee beans and your ad is promoting fishtanks, Google’s going to notice, and your ad’s not going to show. Vertical QS Tax: This is your bid amount. How much you’re willing to pay. Historical Performance: Have people liked your ads and clicked on them in the past. Does it look like people have found your ads appealing in response to their questions? (If this is your first campaign, don’t worry about this). Click-Through Rate (CTR): Your ad campaigns will show higher (for cheaper) if people are clicking on them. This is the beauty of a successful Google ad campaign. 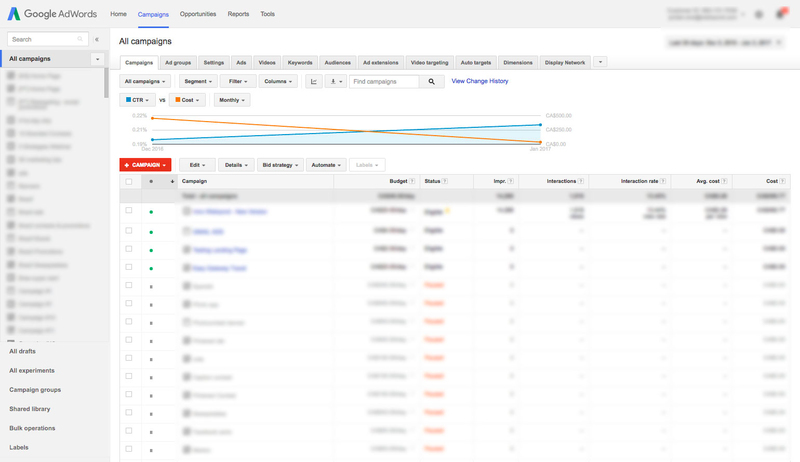 Overall Account Quality: Beyond this campaign, are your other ad sets/campaigns performing? Does it look like you’re a respectable advertiser? Ad Copy Relevance: If you choose “Wholesale coffee beans” as your keyword but your ad is talking about fishtanks (again) you’ll suffer. Keyword Relevancy: If you have a lot of keywords trigger the same ad, at a certain point you’ll stop being able to match copy to keyword. At this point, your keyword relevancy will drop and you’ll lose quality score. Make a new ad set instead. Landing Page Relevance: Does my ad, targeting wholesale coffee bean buyers and featuring wholesale coffee bean copy, actually send people to a page with those keywords? Or am I sending them to my black-market fishtank business? * How Google explains ad relevance: Having an “average” or “above average” status means that there are no major problems with this keyword’s ad relevance when compared to all other keywords across AdWords. A “below average” status means that your ad or keyword may not be specific enough or that your ad group may cover too many topics. The main thing with quality score is to match your ad campaigns (both ads and landing pages) to the keywords which trigger them to pop up. If you start noticing a drop in quality score from irrelevance, take a few of your keywords and use them to create a new ad set with more relevant copy. If you go with a third-party landing page platform, you can actually duplicate your original landing page and change the headline to better match your ad sets. To learn how to see your quality score (once you’ve set up a campaign) click here. Click “Create Ad” and review. Once you’ve published, Google will review your ad to determine if you’re breaking any of its guidelines. This usually takes about a business day. Once you’ve been approved your ad will start showing when someone types in your keywords. I recommend you do some weekly maintenance to ensure you’re running smoothly. Because you’ve set your daily budget, you won’t go over unless you change it. Budget and bid adjustment. Bid more if you see your ads performing well. 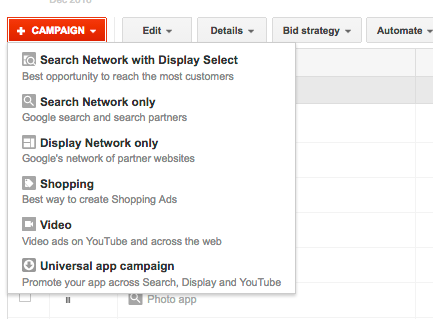 Remove or lower the bid of under-performing ads. Add keywords you’d like to rank for that you hadn’t thought of or Google hadn’t provided. Remove keywords (or add “negative” keywords) to not show when somebody searches for something. Create more specific ads or new ad sets for those keywords which are performing well but don’t completely match up. Add or test out ad extensions like phone number, address, pricing, etc. Google Ads are an incredibly powerful tool for small business. Many small businesses are in niche sectors. As a result, a well-run Google Ad campaign can often be the thing which puts you above your competitors in that niche. If you’re looking for some help with Adwords – including setting up an optimized landing page and email follow-up – Wishpond can help. We’d love to talk business!